Netflix Adds Offline Viewing For Subscribers! Netflix has finally joined the likes of Spotify and Amazon Prime with the update that will finally allow subscribers the ability to download TV episodes and movies that are available on Netflix to their tablet, phone or computer to watch later—with or without an internet connection. The company still offers DVD delivery and Streaming, Downloading is new! There are also the unfriendly internet dead zones like airplanes, subways or grandma’s house this feature will be heaven. For parents this feature will allow them to download multiple shows for the kids to watch on vacation. This will mean a lot more quiet hours in the car on those long trips. By David Ponce on 10/30/14 • Leave a comment! WhatIsOnNetflix is a great website that ranks Netflix movies in descending order of their IMDB or Rotten Tomatoes ratings. It’s updated once a week, and lets you drill down by genre, as well as search for a specific movie. Also, you’re able to click on each movie and be taken to its page on Rotten Tomatoes or IMDB. It’s little limited since it shows you the top 50 movies or so, and doesn’t access lower rated stuff, but that’s ok, because why would you want to watch that anyway? Right? By Chris Scott Barr on 11/23/10 • Leave a comment! I’ve had a Netflix subscription for years. However, after their streaming service became worthwhile, I stopped caring about getting DVDs anymore. I’ve stopped watching them altogether. Once in a while I’ll start to feel bad, and send in a movie that I’ve yet to watch, just so it can be of use to someone else. What I’ve really been waiting for is a streaming-only option. Netflix has finally decided to offer a streaming-only plan for customers in the US. The plan will get you unlimited streaming to your computer or TV. The monthly cost will be $8, which is $2 cheaper than the cheapest DVD plan that also included unlimited streaming. What’s that, the cheapest plan with unlimited streaming is only $9? Not anymore. In addition to rolling out the new streaming-only plan, they’ve decided to raise the price for this plan, likely to encourage people to switch to streaming. Now instead of $9, you’ll need to cough up $10 a month if you want to have your cake and eat it too. By Chris Scott Barr on 10/19/10 • Leave a comment! Last week we were excited to tell you that you would soon be able to ditch your Netflix disc when streaming movies on your PS3. Yesterday, you were finally able to do that. What we didn’t expect was to find that Nintendo’s console was getting the same treatment. That’s right, pop out that red disc and throw it at someone, because you’re not going to need it anymore. It seems that the exclusive deal inked by Microsoft back in 2008 has finally expired. The deal stated that Netflix wasn’t allowed to have installable apps on any other gaming console. Thus, they worked around it by shipping out special discs. Since you weren’t technically installing anything to the consoles themselves, Netflix you were still able to stream content without Microsoft’s deal being breached. 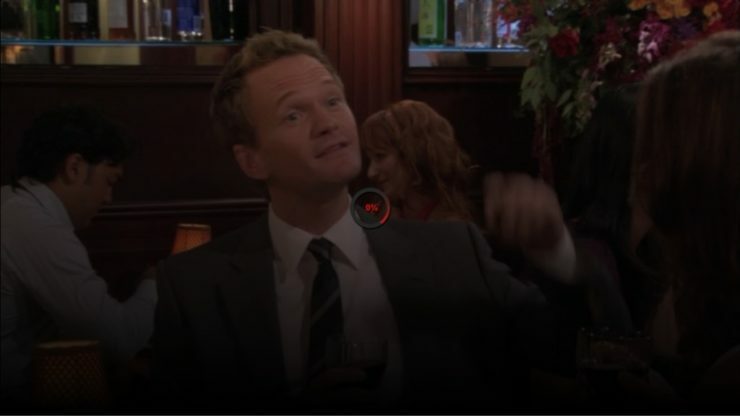 Sneaky Neflix, very sneaky. 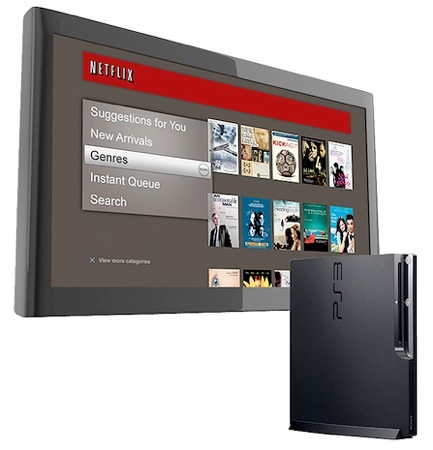 The gaming world rejoiced when Netflix finally started streaming to first the Xbox 360, then PS3 and Wii. Unfortunately for owners of the latter two consoles, you were tied down to a disc if you wanted to take part in the service. Well for the PS3, you won’t have to mess with that much longer. Starting October 18th, you’ll be able to ditch the disc and stream your favorite movies and TV shows from Netflix. That’s not the only new thing coming to the PS3. Apparently you’ll be able to stream some shows and movies as 1080i and/or have 5.1-channel surround sound. That’s something that not even the 360 can boast. Don’t worry though, it will be coming sometime in the future, though the company hasn’t said when. By Chris Scott Barr on 08/30/10 • Leave a comment! With Netflix applications on computers, TV’s and major gaming consoles, it seems like you’re never very far from a device that can stream movies. If you have an iPhone, then you’ll always have access to the extensive Netflix library of movies. That’s right, the company has released an app for both the iPhone and iPod Touch that will allow you to stream movies to either device using WiFi or a 3G connection. I’ve still never found my iPhone useful for viewing anything longer than a short YouTube clip here and there. However, the app will still serve a useful function, aside from streaming movies. You’ll be able to search for movies and manage your queue. This is actually pretty great, since I tend to think of good movies to watch when I’m nowhere near a computer. 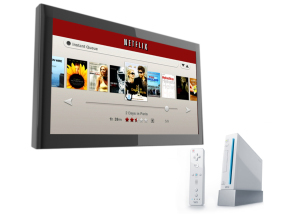 Back in January we told you that Netflix would be streaming to the Wii sometime in the near future. Out of the three, this would probably be my last choice to stream movies to. Not only can you not watch movies in HD (as the Wii doesn’t support HD output) but you’re going to be required to have a disc inserted at all times. Yes, this is exactly the same as the PS3, likely enforced due to a deal with Microsoft. 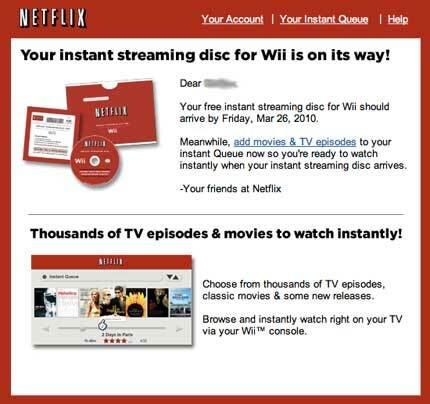 Well if you signed up for your Wii streaming disc from Netflix, you should be receiving it in the mail within a couple of days. If you haven’t done so already, hit the sign-up page here for your disc. I’m excited to see all three major consoles now supporting this. 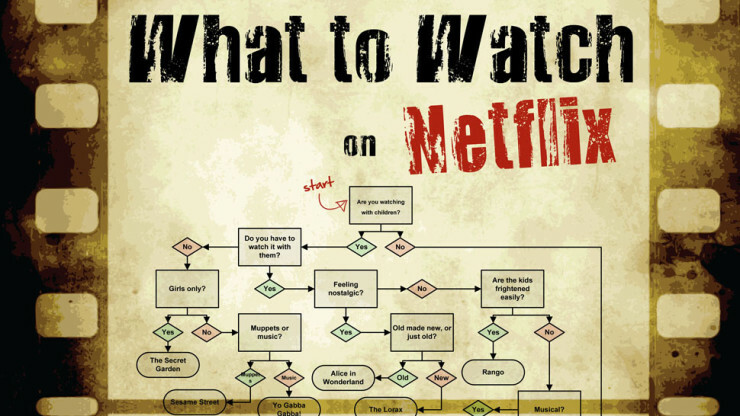 Depending on what consoles you have and where they’re placed, you could have Netflix streaming to every TV in your house. Man, it’s a good thing that Microsoft managed to snag that exclusive deal with Netflix back in August of last year. Otherwise PS3 and Wii owners might have the same access to the rental giant’s instant streaming library. What’s that, the PS3 already has it, and it’s just been announced for the Wii? Never mind then. That’s right folks, despite whatever deal Microsoft snagged with Netflix, Nintendo has just announced that they will also offer the ability to stream Netflix movies to the Wii. As with the PS3, a special disc will be required in order to use this functionality, leading me to again believe that Microsoft’s “exclusive” deal technically only prevented the other companies from installing the software directly onto their consoles. The discs will begin shipping out sometime this Spring, but you can sign up for them now. Aside from the minimum $8.99 unlimited streaming plan from Netflix you will not have to pay any additional costs. Again the trade-off is having to use a disc every time or paying for an Xbox Live subscription, personally I don’t mind popping the disc in my PS3. There is one small drawback to using the service on the Wii, as opposed to the other two consoles. Since Nintendo’s console doesn’t output in HD, you will obviously be limited to watching movies in SD.